Intuitive Password Review 2019: Military-Grade Password Manager? Intuitive Password is an Australia-based password manager service provider. Now more and more internet users are using password manager service to store their different passwords and other personal data. Intuitive Password offers a high level of security to protect their customers’ passwords and other information. In fact, users can not only use Intuitive Password to keep logins and passwords, but also their files, documents, personal sensitive information and anything they want to keep Intuitive Password account. Intuitive Password uses the bank-grade technology called SSL to protect customer’s passwords and other information. Actually all your information and communication happening on Intuitive Password websites are also protected by this SSL technology. SSL standard is also used by US government, bank and other organizations to encrypt important data. SSL can ensure the security of your data when it is stored or transferred to others. Besides, Intuitive Password gives you complete privacy as you are the only person knowing your master password which can encrypt and decrypt your account. 256-bit encryption is also used by Intuitive Password to protect account security as 256-bit can’t be decrypted by anyone. What’s more, Two-factor authentication, anti-phishing protection, advanced password protection, country restriction and more features are added into Intuitive Password service. All plans allow unlimited access to passwords, access passwords on any devices. But they are different in number of passwords, number of shared passwords, maximum field size and many other aspects. Advanced password protection, password generator, anti-phishing protection and search facility are provided by these packages. Many advanced features are provided in other paid packages including Express, Advanced and Pro. You should choose your ideal package to keep your passwords and other data. Free package is the best fit for people who use Intuitive Password first time. 30-day Money-Back Guarantee: Intuitive Password provides 30-day money-back guarantee. If you are not satisfied with Intuitive Password service, you can ask their support for a full refund. Intuitive Password Basic Plan: Basic plan is actually a free trial. And it offers a limited features and functions, but it is enough to test and experience Intuitive Password and help you decide if Intuitive Password is a good choice for you. You can test Intuitive Password on your favorite devices, and actually Intuitive Password software works well with various devices including iPad, iPhone, Android, Smart TV, laptops, and desktop PCs. Under this Basic plan, there is no limitation to access your passwords on any devices. But there is a limited number of passwords that you can store in your free trial account. Free Trial or basic plan just allows 20 passwords stored in your account. You can share only 3 passwords with others. Besides, there are also restrictions on such aspects as maximum field size, maximum note size, number of tags etc. 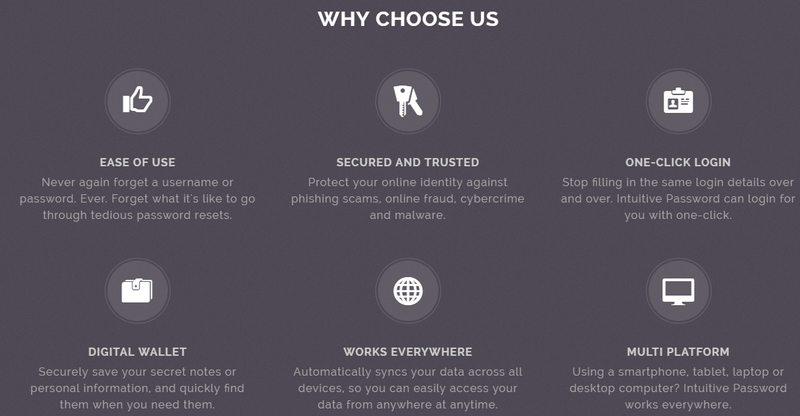 You can also experience their emergency access, anti-phishing protection, password generator and more features with Free Trial. Intuitive Password Express Plan: Express Plan includes all features that Basic Plan has. Express Plan is the basic one among three paid plans. You can also enjoy more features except those features provided by Basic plan. It is easy to handle data migration with this Express Plan. You are even allowed to import all your passwords from other password managers. Intuitive Password provides 5 various formats to let customer to export their data. Compared with other password managers, Intuitive Password is easier to use. Express plan allows users to securely share your passwords and others you want to share with your family, friends and colleagues. You also can easily to make a backup and restore for your passwords and other information. Users can manually organize their custom categories anytime. Intuitive Password gives customers an extra layer of security. You are able to write another security address to your Intuitive Password account. If someone modifies your password credentials or other settings, or someone attempts to log into your account without your permission, you will be received a warning email from Intuitive Password center. They will kindly prompt you about this issue. 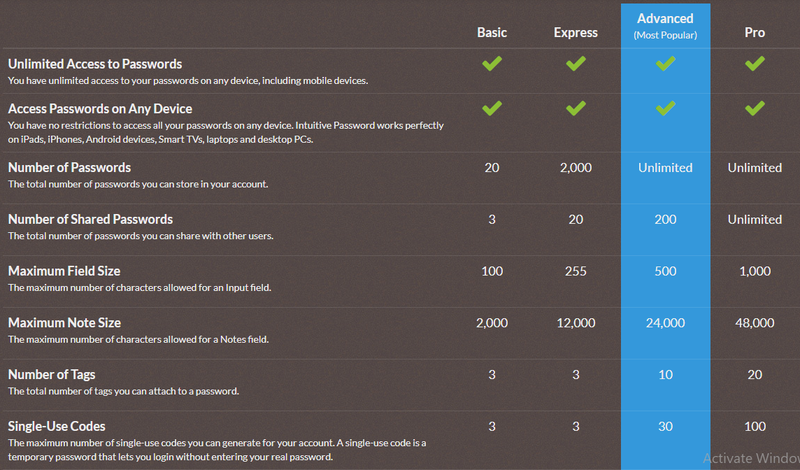 Therefore, Express plan gives a more secure layer to protect your passwords and other staff things. Advanced Plan is the upgraded edition of Express plan. It includes all features provided by Express and has more advanced features. Advanced plan integrates writing, sharing and chatting into password management. Actually, it becomes a little social media app. Advanced plan provides more convenience for their customers. And customers also love this platform more. You can share your passwords and other information with your friends, families and colleagues, and meanwhile you can contact and chat with anyone you want there. You don’t have to change to log into other communication tool like Facebook, WhatsApp or Twitter to communicate the person by leaving Intuitive Password. Besides, Advanced plan also has security email alerts provided in Express plan to alert you when someone accesses your account without permission or attempting to modifying your important credentials. If you have tons of passwords, files, documents, personal data and more to restore into Intuitive Password, this Advanced plan is great for you, as it provides unlimited storage and unlimited passwords. Advanced Intuitive Password can do everything for you, and all your staff thing storing there will be organized by Intuitive Password. Advanced plan has such security features as email security notification, SMS security notification, secure messenger and Two-factor Authentication. Even though Advanced plan cost more than Express plan, it does give more security measures and you also can enjoy more features and convenience. It is actually reasonable and worthwhile very much. Pro Plan is the most advanced plan among four plans provided by Intuitive Password. You can store and share unlimited number of passwords. It even gives unlimited password restore points, but Advanced plan just offer last 90 days restoring point. But what’s restore point exactly? How does it work? A restore point is a representation of a stored state of your data. It works like restoring computer system to an earlier point, you can also restore your data to an earlier point in time by using a restore point. Password restore point is just offered in Advanced and Pro plan by Intuitive Password, which is distinguish feature that other password managers do not offer. In addition, Pro plan is a primary and the most advanced package service, so all security solutions like Two-factor authentication, anti-phishing, and others are included into this plan. Most customers choose to use this plan when their original package like Express or Advanced package is expired, as customers can freely and randomly enjoy all advanced features, technologies and convenience provided by this Pro package. Their Intuitive Password account becomes more secure. Is Intuitive Password a Military-Grade Password Manager? Two-Factor Authentication: Intuitive Password uses the two-factor authentication standard to ensure your account security. After you log into your Intuitive Password account, it will require you to enter some codes created by Two-factor authentication standard. That means you are asked not only for your username and password when logging in account but also the code or login credential like photo, image, fingerprint, passwords and more. Two-factor Authentication standard increases an extra layer of security for customer’s account. You Intuitive Password account will be locked until you enter the correct second layer of password code. It is a security guarantee to shield your passwords and other personal data from hackers and cyber criminals who accidentally steal your master password. Therefore, with this Two-factor Authentication standard, although hacks know your master password, they even can’t access your account successfully as they are required to correctly answer questions or codes about two-factor authentication. So, Two-factor Authentication is the important shield to protect your password manager account. 256-bit encryption is the and strongest and most advanced encryption method, which is usually used by many industries in data protection like VPNs, password managers, security tools and more. Intuitive Password also applies this powerful encryption method to protect and encrypt user’s password and other personal information. 256-bit is the length of the encryption algorithm, and it is the longest one. 256-bit is reported to be unbeatable encryption type as no one can decrypt this encryption type. It is said that even though a group of fastest computers in the world are grouped to work out this 256-bit, they will never defeat it successfully. No matter what exaggerating description is used in this 256-bit, it all tells a truth that 256-bit encryption is the strongest and most unbreakable encrypt methods, and has a really strong performance to protect data and any kind of important information. U.S. government and military also once used this encryption to protect and keep their important files and data. Therefore, 256-bit encryption is called military-grade encryption. Intuitive Password with this 256-bit together with SSL certificate will give their customer complete security when storing their passwords and other personal data there. In fact, 256-bit encryption is also a choice point when people comes to select a password manager or other data protection tools like VPN, it is said that 256-bit encryption is a selling point. So, 256-bit is an important security standard for password manager. If your password manager product has not utilized this strongest encryption method, it may not be preferred by customers. Password Manager with 256-bit encryption is usually classified into the most secure tool to store passwords. DDoS protection is added into Intuitive Password. DDoS protection mainly helps customer to check if their network is free from malware, virus and other online attacks. In reality, Intuitive Password integrates strong antivirus with regular updates and constant scanning. Therefore, customer’s data stored in Intuitive Password is actually kept into a shield with multiple layers of firewalls to prevent online threats from accessing your data. Nowadays, cyber criminals always create strong and aggressive malware, ransomware, identity theft, phishing attacks and other malware things on the internet in order to target more victims’ devices and other tools to steal personal data. The malware attacks can sneak into your device or tool in different ways. The most common way is that cyber hackers spread the malware into the network, and when people browse on the internet or open malicious websites, these kinds of malware will soon drop and install into your device without any knowledge. Actually this kind of malware or identity theft thing can be installed into background within few seconds. Next, it will get into your important data storing place to steal all your precious data for illegal profits. Actually more and more cyber hackers also turn their eyes into password manager devices as password manager usually help customers keep many different logins, numbers, accounts, and other personal data like passports, drive license, ID number, credit card number, online backing account and more. Cyber hackers always design different specific malware thing particularly target password manager like Intuitive Password. Therefore, now password manager products also integrate different malware prevention solutions in order to keep away from malware attacks from network. Once the strong and aggressive malware like ransomware attack your password manager, it will be a big threat to your passwords and other personal information. Take ransomware for example, it not only locks you out of your devices but also log into your account to get your personal information and meanwhile scam you paying ransom. Then you not only face private information leaking but also lose money and device. DDoS protection provided by Intuitive Password has a strong ability to detect and scan cyberattacks. It can prevent your Intuitive Password account from being targeted by any kinds of malware infections. What’s more, Intuitive Password also has such security measures like anti-phishing protection to protect against phishing attacks scams. Intuitive Password can scan and check if your network environment has been infected with online threats. It can soon send you an email message to tell you this dangerous issue. Intuitive Password uses DDoS protection together with other security measures like anti-phishing to keep your account away from any kinds of malware, virus, ransomware, identity theft and other scamming things. Intuitive password is really a strong and secure password management and data protection center for customer who need all around the world. Many customers rate it to be the military-grade password manager. You not only can use Intuitive Password to store password, restoring password and data, but also can use it to generate strong and unique passwords for different accounts. You don’t need to pay for an additional charge for this password generator feature as it is a free service. Intuitive Password can help create high secure passwords which are hard to guess. Usually if you create a simple even simple password, it will be easy for cyber hacker to guess your password. A strong even uncrackable password is the first strong firewall to block cyber hackers from stealing your personal information and assets online. Intuitive Password provides Four plans or packages: Free, Express, Advanced and Pro to let customers to select their ideal packages to protect and store their passwords. Different plans have different password management solutions to help you keep passwords and data in a safe place. If you are a new user to this Intuitive Password, you can try their Free plan or basic plan first, as you can test and experience many features provided by Intuitive Password. But if you want a more advanced storage and protection for your passwords and other personal data, you are suggested to choose Express, Advanced or even Pro. Many last Customers rate the Advanced and Pro plans are best-in-class. You can freely do anything under these plans and enjoy more advanced and outstanding features and technologies. Besides, their technical team has highly skilled and experienced ability to optimize and upgrade their Intuitive Password service. Intuitive Password is also cutting-edge designed and provides simple and intuitive even easy-to-use interface and dashboard. They provide the most affordable and reasonable price on every plans for customers.